Built within the Fort Garry School District, this school was named for Harold Rupert Leofric George Alexander (1891-1969), Governor General of Canada from 1946 to 1952. 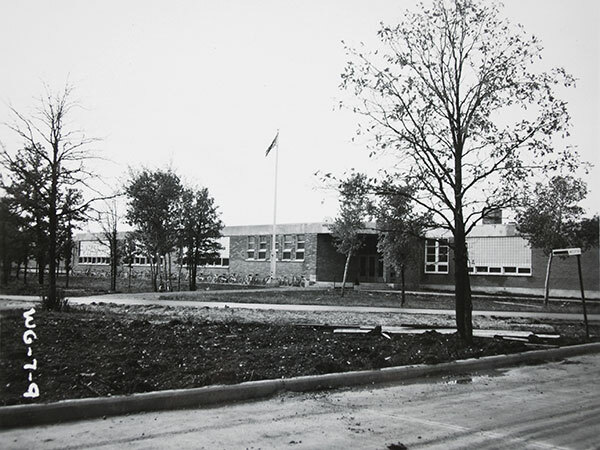 Designed by the Winnipeg architectural firm of Green, Blankstein, Russell and Associates, the cornerstone of the single-storey, six-classroom structure was laid in October 1948 though, at the time, it had not been determined whether it would serve as an elementary or junior high school. The brick and concrete building was constructed at a cost of $106,000 by the contracting firm of G. A. Baert. Known informally as Fort Garry High School or Fort Garry Collegiate, it was formally named Viscount Alexander High School to replace the high school capacity at General Byng School. It was opened on 30 August 1949 by Deputy Minister of Education R. O. MacFarlane. Also present at the opening ceremony were Fort Garry Mayor L. R. Fennell, School Board Chair Mrs. R. F. Peterson, past School Board Chair G. M. Farwell, Secretary-Treasurer A. P. Cameron, and Reverend D. B. Sparling of the Fort Garry United Church. The building featured brightly-coloured pink, yellow, green, and white brick classroom walls, with floors of asphalt tiles and terrazzo, large natural lighting features, an airflow and ventilation system that focused on the closet areas within each room, and other modern amenities. Dimensions of the original structure were 140 feet by 70 feet. It hosted grades 7 to 11, initially using only five of the six classrooms, with the last being rented to the Fort Garry Kindergarten Committee. At the school’s unveiling, Mr. G. M. Farwell, a 13-year school trustee, was given an engraved silver trowel with which he had laid the school’s cornerstone the year before. Built with the anticipation of future expansion, in 1952 the school was enlarged with five more classrooms, secretary’s office, science laboratory, library, and kindergarten room at a cost of $65,000 based on designs by the architectural firm of Prain and Ward. An auditorium was added in 1956, and ten more classrooms were added in 1959. High school grades were later transferred to the Vincent Massey Collegiate. Source: Archives of Manitoba, Government Photographs (CH 0267), GR10030, WG-7-9. “Tenders wanted for general contract for school building, Fort Garry, Manitoba for School District of Fort Garry No. 2047,” Winnipeg Free Press, 31 May 1948, page 26. “School ceremony in Fort Garry,” Winnipeg Free Press, 14 October 1948, page 12. [Photo caption], Winnipeg Free Press, 18 October 1948, page 11. “Rhodes Smith to open new Fort Garry school,” Winnipeg Free Press, 26 August 1949, page 3. “Light and color to brighten study at new 6-room Fort Garry school,” Winnipeg Free Press, 31 August 1949, page 3. “Tenders [Viscount Alexander],” Winnipeg Free Press, 17 April 1952, page 32. “Fort Garry notes,” Winnipeg Free Press, 3 October 1952, page 9. “Tenders,” Winnipeg Free Press, 13 April 1956, page 5.